Designing for a surface 7 metres × 3.6 metres is a little different than for on-screen or a brochure, especially as the Ubuntu/Canonical Brand Guidelines don’t have a dedicated section for billboards yet! The design here was originally sketched by David Cotter for the Computex Show, and updated by Emily Maher for the FISL request. 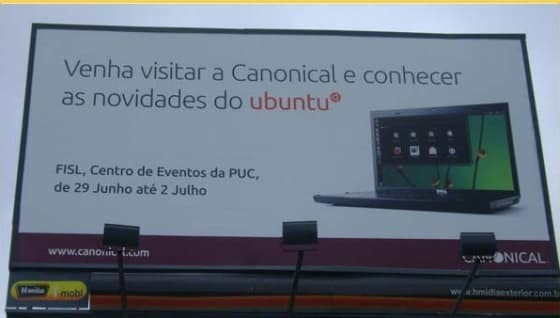 Venha visitar a Canonical e conhecer as novidades do ubuntu! I had been discussing this with Marcus Haslam, the Lead Brand Designer at Canonical … we want to work a few more things out before creating a dedicated piece in the guidelines and we need to make some adjustments, for example, the large format dots do not translate well on to such a large format. The dots were almost invisible when viewed from below, so we need to run some more tests at various sizes of the dots next to text and get proofs so we know how best to advise people. Emily felt it was perhaps a little soon to lay down definite guidelines; but on the branding side the guidelines still translate, with the photograph angle, colours and border-style still applying directly. Has anyone in Brazil spotted the billboards yet, or would you like to see billboard templates covered as part of the resources in the The Brand Toolkit?